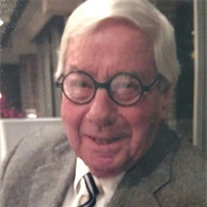 McINTYRE, Lloyd John of Thomas Twp., MI, passed away unexpectedly on Monday, May 9, 2016 at Covenant HealthCare – Cooper. He was 87 years old. Lloyd John McIntyre was born on July 15, 1928 in Brant Township, Michigan, the son of the late Alex McIntyre and Gladys (Kelly) McIntyre. He graduated from Arthur Hill High School in 1946. Lloyd served his country with the U.S. Army during the Korean War, where he earned a bronze star. He married the love of his life, June M. Reimer on December 29, 1951 in Saginaw, MI. She preceded him in death on August 16, 1999. Lloyd worked alongside his beloved step-father, John Mooney and brothers, at their family business Mooney’s Ice Cream, for over 50 years. He was a faithful member of Holy Spirit Catholic Church and the Saginaw Country Club. Lloyd enjoyed attending concerts at the Saginaw Symphony Orchestra, and then spending time with friends at the Saginaw Club. Lloyd found enjoyment in landscaping and maintaining his beautiful home and yard. Surviving are his loving children, Sean M. McIntyre and Heather G. McIntyre, both of Saginaw; grandsons: Corey J. (Stephanie) Miller and Bradley M. Miller; great granddaughters: Addison and Emma Miller; brother, Kenneth (Shirley) McIntyre; sisters-in-law, Polly McIntyre, Sr. Jean Reimer, Joan (James) Sullivan, Joyce Nelson, Marge Reimer, Sue Reimer and Janet (Hugh) Halby; he is also survived by numerous well-loved nieces and nephews. Lloyd will also be dearly missed by his close friends: Louis and Veronica Furlo, Robert and Carol George and Marianne Smith. He was preceded in death by his wife, June; mother and step-father, Gladys and John Mooney; his twin brother, Floyd McIntyre; brothers: Bernard (Suzanne) McIntyre, Roland (Doris) McIntyre, Roderick (LaVonne) McIntyre; sister, Anges (Leon) LaRocque; brothers-in-law, Tom Spence, William Nelson, Jerry Reimer and Mike Reimer. FUNERAL: A funeral liturgy for Lloyd will be held at 11:00 a.m. Saturday, May 14, 2016 at Holy Spirit Catholic Church, 1035 N. River Rd., Saginaw. Rev. Fr. Peter J. Gaspeny will officiate. Military honors under the auspices of the U.S. Army and V.F.W. Post #1859 will follow at Oakwood Mausoleum. VISITATION: Friends are welcome to visit with the family on Friday, May 13, 2016 from 2:30 until 8:00 p.m. at the Deisler Funeral Home, 2233 Hemmeter Rd. (off State). Lloyd will lie in state at the church on Saturday, May 14, 2016 from 10:00 a.m. until the time of Mass.